The Challenge: Find a reason to celebrate and do something to celebrate it. Happy 1st Hump Day (for 2006, that is)! In my opinion kids are experts at celebrating. They don’t need any official notice from Hallmark for permission to celebrate. They know what it takes to make for a fulfilling celebration. Typically the components are as follows: special ‘eats’, decorations or hats, and oftentimes games. So, I did the best I could with the resources I had, which I think is key to this challenge. P lease don’t go out and buy a bunch of stuff. I found some fun camel clip art online and printed off a few copies. I also dug out the camel from our Christmas nativity set. I hung up a few pictures of camels and prominently displayed the camel figurine on a shelf with some white Christmas lights. 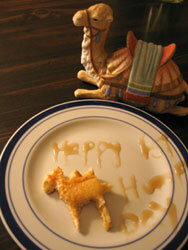 Bringing in the celebratory eating, I made camel shaped pancakes for breakfast and a carrot cake, drawing a camel on the top, for dessert. 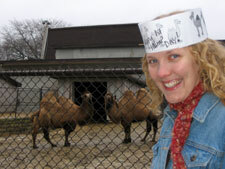 Oh yes, and my camel hat, which I made from the clip art pictures. I proudly wore my hat to the zoo to make a special visit to today’s mascot. Not only am I lucky enough to have a free zoo two miles from my house, but both of the camels were out and happy to have a visitor on this cold dark day. My game of choice for this special occasion: pin the hump on the camel. Jason spun me way more than I spun him, leaving me quite ‘off.’ Being a retired kindergarten teacher gave me a slight advantage. We celebrated everything in Kindergarten, from the 100th day of school to Dr. Seuss’ birthday. You name it. The camel pancakes were fun but nothing beats green eggs for breakfast. I was a little under the weather today. But not so much so that I couldn’t celebrate Earth at Perihelion Day. That’s right folks, today is the one day that the Earth is as close to the sun as it will be all year. The holiday is surprisingly absent from my calendar and a glaring omission in the online catalog of Hallmark eCards (perhaps a Kim & Jason greeting card is in order…). I must admit that Earth at Perihelion Day is not a festival I’m accustomed to celebrating (I got a little help from Brownielocks and the 3 Bears) so I wasn’t quite sure how to correctly mark the occasion. I assumed that we were headed for a hot spell* so I got decked out in my swimming trunks, Cruisin’ for Wishes t-shirt, and sandals (this little detail really had Kim smiling, as I NEVER wear sandals). My accessories included an authentic plastic Hawaiian lei, some beads I got once at Red Lobster, and a jester hat. I’m not sure where the jester hat fits in, but it IS festive, and Earth at Perihelion Day is nothing if not festive. All in all, it has been a great day. A simple, fun, holiday free from the trappings and commercialization of corporate giants like Hallmark. *As this article indicates, this was an ill-conceived assumption. Hmm. I can’t think of anything, but if I’m feeling better I have tomorrow off so I’m sure I can come up with something. Three words: Triple. Cheese. Pizza. I did some fancy paintShop work to make the picture look good! I decided that the thing to really celebrate today is LIFE! Today my wife and her sisters are taking their mom up to Chicago for a MRI and a Dr. visit to learn the results of the test. Seems old Ruthie has a pain in the back again and maybe old man cancer has reappeared. Linda(wife) is concerned and so I figured that maybe she would need some cheering up and maybe I could celebrate LIFE and make her day a little brighter. Linda has always been a stay a home mom and I have always been a stay away from housework dad. So I decided to brighten up the old master bedroom and I tried to put on the brightest sheets I could find in the closet. Simple right except for they come in two types and I was pretty sure the one with the stretchy stuff in the corners went on first. We have a queen size bed and its hard to tell which way goes which way. I got 3 corners done and then looked at the last corner and I figured that if I could stretch that over the last corner of the mattress that would be something and I think it would have been shaped like a hammock. This sheet was clearly too small! Went digging in the closet for the next brightest sheet and that one fit fine. Put the top sheet done and I noticed a large tear where the white edge meets the main material. No problem, put that at the foot of the bed and I’m set. Blankets on, comforter on, and new pillow cases. Done! Throw the dirty linens in the hamper and back to work. I was on my lunch hour. I know I created some work for someone in washing but I have to be honest with you. I have never turned on those 2 white side by side cubes in the laundry room in my 30 years of marriage. After work I picked up a bunch of fresh yellow tulips. Linda’s favorite color. Lite our newest Kim and Jason candle- mistle toe and I’ll wait for Linda to come home. And maybe if she is a little blue she’ll be able to celebrate her life with Ruthie and me too! Well, the thing we celebrated today was “2nd Hand Wardrobe Day.” In honor of this occasion, we went through the closet and found some clothes that either we didn’t wear or didn’t fit. Then Doug and I took a nice drive, to celebrate Mr. Chrysler inventing his first car today, to the Goodwill. We dropped off the clothes and did some shopping of our own. It was a great way to give back and celebrate as well. Celebrated Mud. Went on a mud run and found every puddle possible (not hard in Seattle), the muddier the better. Got some good looks at the office when I walked back in after the excursion. That’s right folks, today you should all have paid tribute to a landlord. On this day in 1935, the Landlord’s Game was patented. Many of us call this game Monopoly. 🙂 The celebration was to play a game with my husband – since my daughter would just choke on the parts. Alas, he’s sick and we’ll have to celebrate another day! We recently got a smoothie maker (OK, a blender really, but to me it’s a smoothie maker!). So, yesterday I decided to celebrate Smoothie Day and try lots of different combinations. January 5th is National Bird Day and I decided to celebrate my favority bird – PENGUINS! After waking up under my penguin sheets, I put on my penguin t-shirt, drank my coffee from my penguin mug and filled my Chilly Willy water bottle. I smiled and celebrated another aspect of the day – bringing happiness to another person. That’s worth celebrating and I think I’ll keep a sheet of those tiny penguin stickers with me and see who else I can celebrate life with and maybe laugh just a bit. OK, finished up last night with a celebration of Crushes. There was Orange Crush — song and beverage. And crushing lots of things. The invite (to myself) had Johnny Depp on it. Who wouldn’t want to celebrate that! I celebrated the word so, because I use it way too much, and figured it was time to give it the credit it deserves. Making use of the resources and circumstances today presents, I’m going to have an Eskimo Party today. It is supposed to snow a foot today on top of the two feet we already have. Than means I’ll be spending some time shoveling walks and clearing snow off the roof. I already have a good pile next to the drive way so, I think I’ll invite the grandkids over and well excavate an igloo (snow cave)in that pile and climb inside and light some candles and drink hot cocoa and rub noses together and pretend there’s a polar bear outside and get scared and everything. Then we’ll tube off the top for a while and when we get cold we’ll come inside and watch Nanuk of the North while we glue together some Inuksuit to help us find out way. I’m off to the library to see if they still have Nanuk of the North, a great video about a year in the life of an Eskimo. It didn’t snow a predicted, so that afforded me more time for the play parts of the party. It was a great day, lots of fun. Nanook of the North was amazing. You can see an excerpt on my blog. What a life changing experience to, so intimately, witness their lives of joy amid such harsh conditions. Thanks, and I’m of to eagerly face the next challenge. I decided to celebrate flowers. I used to do this every time I’d see a flower (when I was a kid). I would have to pick every flower I’d see and worship it by making flower wreaths for my head or put them in little glasses of water and leave them for my mom. Little did I know then, that the surprise it usually gave her was really a shock to see her best roses mangled in a fruit jelly jar turned juice glass by her bed. I decided to resurrect by inner flower child. Since it is summer (in the South) and dry (as in drought), flowers are few and far between. But I searched anyway. I found that our rose bush had a few small, weak looking roses and the yard didn’t have any of my familiar buttercups to adorn my crown. I persevered. I did find dandelion flowers which made a great wreath. I pulled the petals off of the roses and placed them around a small cake. (Okay, it was really a doughnut, but it was the cakey type.) I sang kum ba yah, and some other flower child type songs I learned years ago. I seemed to forget some of the words, but I made up some that sounded just as good. Since I was low on flowers and not wanting to spend money on my celebration to buy some, I made some with my new balloon skills I learned in the 1st challenge. I was really having fun celebrating (thank goodness my husband was at work) when I look over at my dog. His expression was priceless. His eyebrows were cocked like Spock would do on Star Trek. It was like he was saying “Who are you and what did you do with my mommy?” I started giggling and that made it worthwhile. I might make a yearly holiday for flowers, I think though, it will be in the spring when they are more readily available. Peace! Happy Guinea Pig Day! I celebrated the holiday with the critter of honor, my guinea pig, Mister Carmel. I set up a large play area for him to be in all day, and gave him some apple for a treat. For food I had veggie pizza and popcorn (guinea pig owners will get the reference), and drank from a water bottle like a guinea pig would. I spread fleece blankets on the floor, the same type of bedding I use in Carmel’s cage, and for fun I tried to teach him a trick – to spin around in a circle before getting a treat. He successfully did this one time, and I’ll continue to work on teaching him this and possibly other tricks in the future! And just for my precious guinea pig I drew a card on construction paper and taped it on the wall over his cage. Today was lots of fun, giving special attention to Carmel and partying. Guinea pigs are the best, and so is Guinea Pig Day! I found out that this week is National Back Yard Games Week. So I went to our local Dollar General and picked up a kids lacrosse set, a soccer ball & net, a bubble gun, and a ring toss game. For only fifteen dollars, the four uf us had a GREAT time together. Find me on facebook to see pics. I had a super great time throwing my Instaparty! A bubble bath, a book, pizza, a movie, a cupcake, and a game. Couldn’t have been a better to celebrate the completion of my very first half marathon! I couldn’t find anything to commemorate (no official days or anniversaries of anything I could celebrate with my kids) so I turned it into Mary Poppins afternoon. My kids had never seen the movie, but had been taken by a free CD that came in the paper, of the Australian stage cast singing a few songs. So we had a picnic lunch in front of the TV (big deal here – we don’t eat in front of the TV normally) and watched the movie. We then had a fancy afternoon tea with cakes and milk in a teapot for the kids (and a cuppa for me). Then we went outside and drew chalk murals to jump into. Later we might make some raspberry ice (Mary Poppins orders it from the penguins in the chalk scene) and have it for dessert – and we don’t have dessert on a weeknight unless it’s someone’s birthday.